Published By The Eric Reyes Law Firm, P.C. Dog attacked me and caused me to fall off my bike. Do I have a case? I was riding my bicycle in Oak Cliff, Dallas Texas on November 1, 2016 when I was attacked by a dog. I suffered serious injuries including a fracture of my vertebrae my low back and significant lacerations on my hands and face. I know the owner of the dog does not keep the dog inside the fence and allows it to roam in the neighborhood. Do I have a case? In Texas a dog owner may be liable for the injuries that his dog inflicts on someone else. There are two theories of all that will allow recovery in Texas. The police officer gave me a ticket in a car accident. But I have a witness! Question: I was involved in a motor vehicle accident on Hemphill and Magnolia in Fort Worth, Texas on September 5, 2016. The other driver ran a red light but the officer found me at fault for the accident. I got the ticket! I have an eyewitness to the accident but the officer did not talk to him before he left the scene of the collision. What can I do? Answer: Insurance companies investigate motor vehicle accident claims every day and determine whether their insured (in this case , the driver who ran the red light) is at fault for the accident. Their investigation includes talking to the parties involved in the accident, acquiring a copy of the police report, interviewing witnesses who saw the accident, and examining the scene of the accident as well as the property damage to the cars. 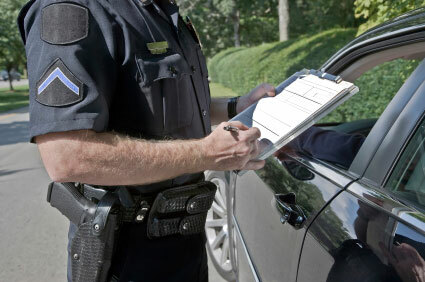 Insurance companies do rely upon the police report to help them make a decision whether to accept liability regarding a motor vehicle accident or deny the claim. However insurance companies are not controlled by the police report and what the officer’s opinion is regarding who caused the accident. I’ve seen many cases where insurance an company will ignore the police report if it contradicts what their own insured said regarding how the accident happened. Most good insurance adjusters will look at all the evidence to make a decision on whether to accept liability on behalf of the client. But not always. Most experienced adjusters know that an officer’s opinion is not admissible in evidence if they did not witness the accident. Most police officers are not accident reconstructionist and they are not qualified to give an expert opinion regarding who is at fault for accident without special training and experience. 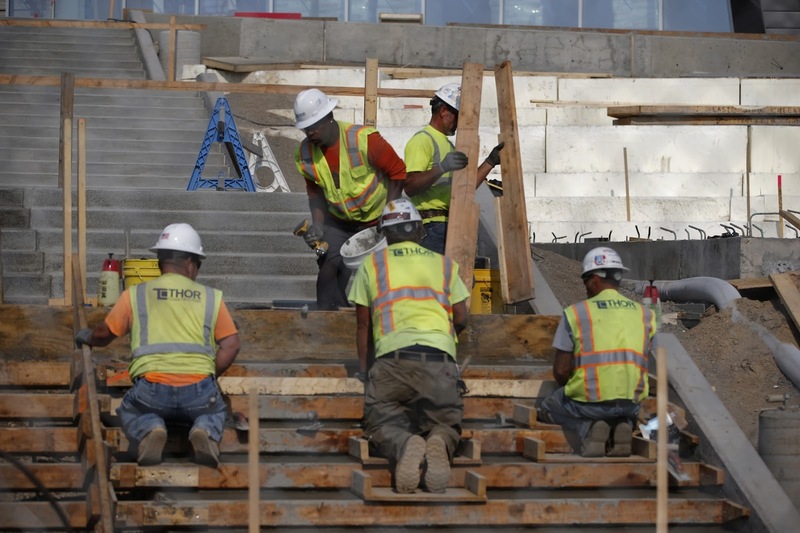 I got hurt on the job in Dallas Texas.My employer says that I must arbitrate my claim against the company for negligence instead of filing a lawsuit. Can my employer force me to arbitrate a claim instead of letting a jury decide whether my employer was negligent and how much I should be compensated for my damages? If you sign a contract usually at the beginning of your relationship with your employer that stipulates that you must use arbitration as a tool to resolve any dispute including on-the-job injuries against your employer, there is a strong likelihood that a court will force you to arbitrate your claim instead of taking your case in front of a jury. 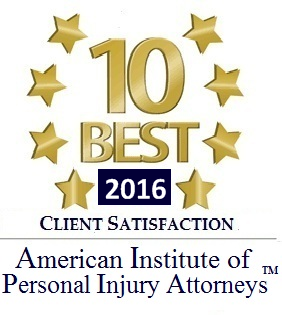 On May 10, 2016, Eric Reyes was nominated by the American Institute of Legal Counsel as one of the “Top 10” attorneys in personal injury in the state of Texas for 2016. This award celebrates the attorney accomplishing the highest degree of professional achievement in his field of law and an impeccable client satisfaction rating. Consumers seeking legal representation are often at the mercy of the attorney’s self-serving statements in websites and other forms of advertisements. Attorneys that have been recognized by an impartial third party organizations based on the attorneys documented excellence in their field of law, helps the consumer find the appropriate lawyer for their problem. The American Institute of Legal Counsel is an impartial third party attorney rating organization consisting of six departments from criminal, DWI, personal injury, family law and litigation, lawsuits and disputes. This attorney rating organization concentrates on recognizing attorneys that have achieved the highest degree of professional achievement in their field of law and the attorney’s success in client satisfaction. Membership in this organization is an exclusive honor that only few attorneys achieve and enjoy. I fell off a roof at work. What are my rights? I work for a roofing company in Dallas, Texas. I fell off the roof and suffered injuries to my neck and back. My employer did not carry workers compensation insurance. Two days after the accident, I signed a release when my employer paid me $500. When I signed the release, I had not even had a chance to see a doctor. My back now hurts and I want to go see a doctor but my employer refuses to pay for the medical bills. I live in Fort Worth Texas. What are my rights? I was injured in a car accident in Dallas, Texas on January 2, 2016, by someone else’s negligence. Who pays for my medical bills from this car accident ? There is a misconception that if someone causes your injuries from a motor vehicle accident that they must pay your medical bills as you incur them. Unfortunately this is not true. Your medical bills are always your legal responsibility. However, the responsible party (we call this person a third-party) is legally liable to reimburse you for your medical bills at the time of settlement or as ordered by a court in the form of a judgment after trial. Normally, a person that causes the accident has liability insurance to pay the medical bills as well as the other damages that you suffered in the motor vehicle accident. 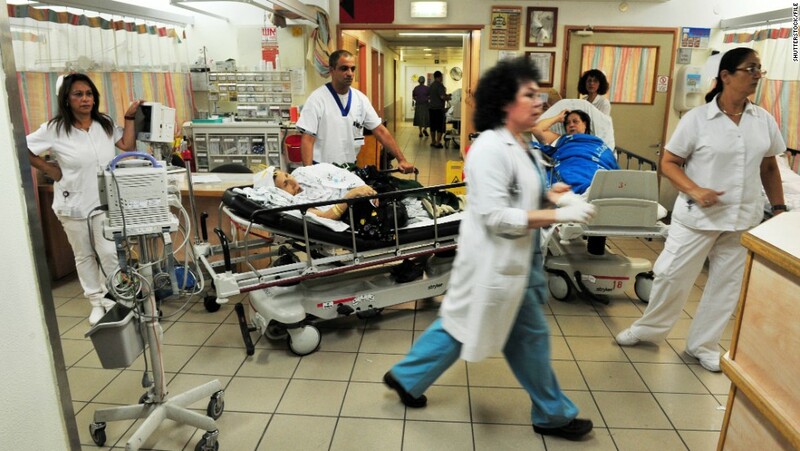 There is no legal process that transfers the responsibility to pay the medical bills to the negligent party. Instead what normally happens is you will be reimbursed for the medical bills that you paid out of your pocket or what you owe the medical provider or the third party (group insurance company, Medicare, Medicaid etc.) that paid your bills. Eric Reyes Accident App . Download for free! Download our Free accident app today! I was injured on the job . What are my rights and options? 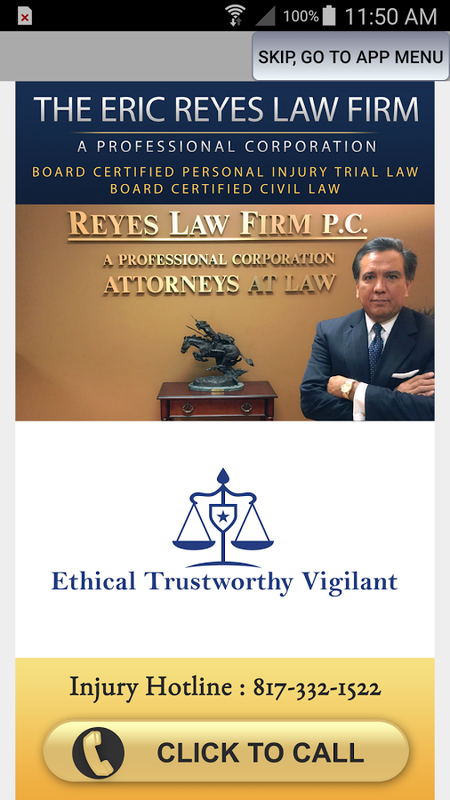 On October 30, 2015, Eric Reyes received his Board Certification in Civil Law by the National Board of Trial Advocacy ( NBTA). He is already Board Certified in Personal Injury Trial Law by the Texas Board Of Legal Specialization (TBLS). A person injured in an auto accident or other type of accident caused by someone else’s negligence in the Fort Worth and Dallas area can rest assure that Mr. Reyes is fully qualified and highly trained to represent them regarding their claim. What is civil trial law? First, civil trial law includes the body of law that regulates the legal duties and responsibilities between individuals and corporations. 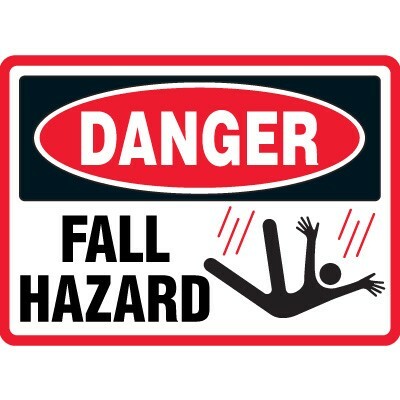 This includes personal injury litigation which he is already board certified in by the TBLS. Second, civil law normally involves monetary damages that are in dispute. The NBTA is the first American Bar Association-accredited attorney board-certifying organization. The NBTA offers board certification in civil trial law, civil pretrial practice, criminal trial law, family trial law and Social Security disability law. On April 26 2015, a fatal accident occurred on the southbound ramp of the Dallas North Tollway at the President George Bush Turnpike at approximately 5 AM. 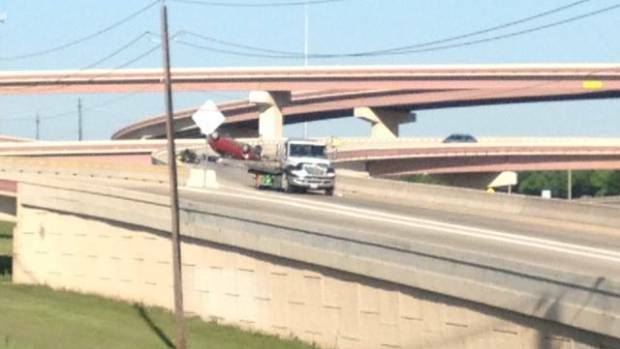 According to the Dallas Police Department, a Nissan Sentra crashed causing the vehicle to turn upside down on the roadway on the southbound exit ramp. Two motorcyclists who were traveling behind the Nissan Sentra when they were unable to avoid the collision with the disabled vehicle and crashed into the Sentra. One of the motorcyclists was killed in the collision and died at the scene of the accident. The driver of the Nissan was taken by ambulance to the Medical Center of Plano with serious injuries. The other motorcyclist was taken to Baylor Hospital in Plano also with serious injuries. What is a summary judgement? Copyright © 2019, The Eric Reyes Law Firm, P.C.